The 2008 Ski-Doo Snowmobile for Sale by Owner has a new track and less than 1000 miles on a fresh motor. This snowmobile runs excellently, has 4768 total miles. 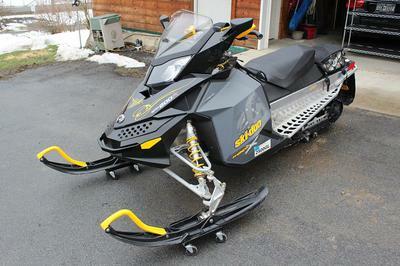 This nice, used SkiDoo has all the potential for winter fun that anyone could possibly ask for. Anyone that has experience with this snow mobile can use the comments form below this ad to write a review or voice any opinions that you may have on its dependability, performance, problems or where to find used snowmobile parts for repairs or maintenance. Thanks for visiting GoGoCycles Used Motorcycles for Sale and for your interest in the 2008 Ski-Doo Snowmobile for Sale by Owner. The location of the used Ski-Doo for sale is Granby, CO Colorado and in my opinion my asking price for this setup is cheap enough that it will be difficult to beat on Craigslist or on Ebay; just $4999! If you want to take a look or have questions, call me (NO EMAILS) at 970-887-9three37 for more details or to request picture and don't forget to mention that you found this ad on GoGoCycles Used Motorcycles and Parts for Sale www.gogocycles.com.